Second page with Dolls of the World Collection. These are some of my favorite dolls. 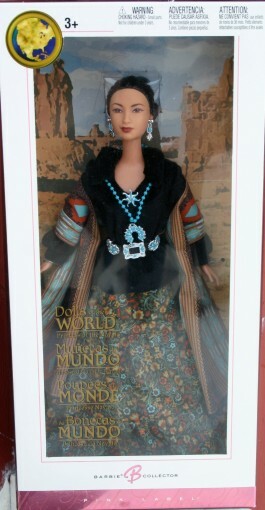 but a mix from all kinds of releases with dolls in folk costumes from all over the world. 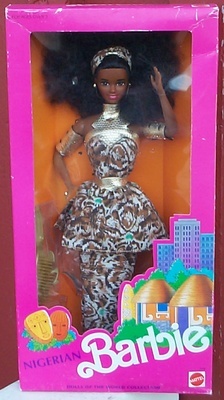 The first black doll in the DotW series was this gorgeous girl from Nigeria in Africa. 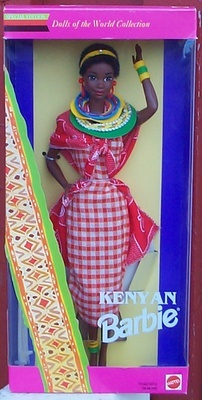 This is the third doll from Africa and she represents the proud Malaian people of Kenya. She has very short hair and is really darkskinned. I love this Nichelle mold! A wonderful girl in the darkest skintone ever!!! This Shani faced girl is dressed in a lovely Kente print outfit and comes from Ghana on the west coast of Africa. One of my favorite versions of the Christie mold. A light skinned girl from Northern Africa. Second Eskimo edition. This version has a more vivid coloration than her predecessor. A lovely girl! To the right is the first Eskimo that I found loose. This is actually the third Eskimo edition but the two previous versions have been dressed in white "seal skin" costumes and come from Greenland. This version is a Canadian Inuit. A wonderful use of the Midge/Diva mold. I love Indians and HAD to have this one. My brother bought her in London for me... For cash at Harrod's which was a big thing there. LOL! 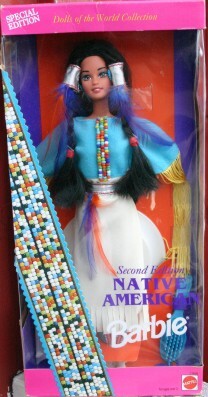 Teresa lent her face to the second Native American Barbie doll. She came dressed for PowWow in a turqouise and tan colored outfit. 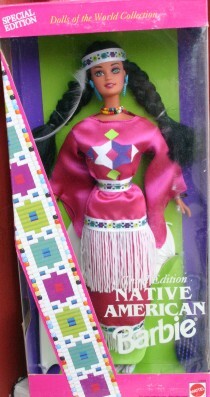 Also the third Native American Barbie doll is dressed for PowWow in a more modern costume version in pink silk. She is also made with the Teresa face and is just as pretty as the others! The fourth edition was back using the Midge/Diva sculpt and she is dressed in brown buckskin with lots and lots of fringes. Exclusively sold at TRU. This is a very pretty lady in tan/turqouise buck skin. Beautiful! 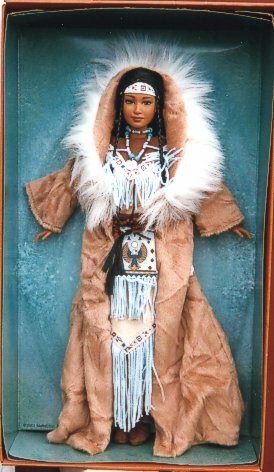 Living in the cold winds of Alaska the NWC Indian is wrapped up in a beautiful robe and shawl. This girl was made with the Angel/Goddess face and is part of the group of dolls that celebrates the 20th Anniversary of the Dolls of the World Collection. This group also finishes the series as after these, the Princess Dolls of the World series takes over. Navajo Princess was made with the Lea face. The Dolls of the World, Princess Collection continues. 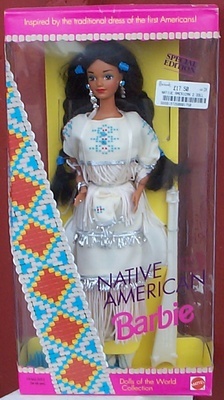 This is the first Native American Barbie from the series American Stories Collection. 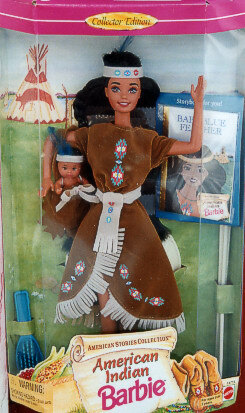 Barbie comes dressed in brown buckskin and carries a baby, her cousin Baby Blue Feather. A gorgeous doll that is the first in a series called Spirits of Nature. 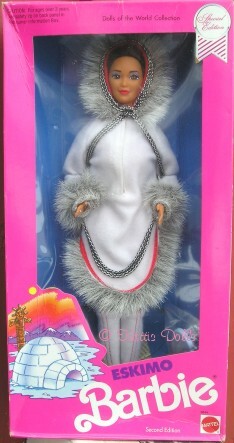 Barbie's outfit is inspired by the Earth in brown "fur". 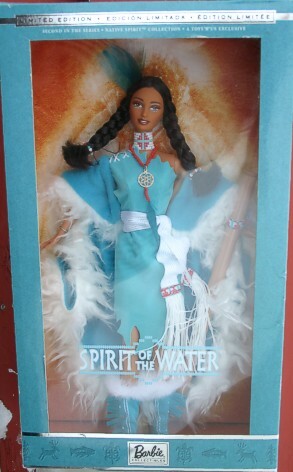 Another pretty Indian Barbie doll in the Spirits of Nature series. Her turqouise "buck skin" is the color of floating and running waters. This is the first two-doll set to be sold in the DotW series. Barbie comes with a little baby, both dressed in the beautiful colors of Peruvian Indian weaves. This second edition is made with the Oriental headmold (the first one has the Steffie mold). The Princess of the Incas has the DARLING Angel face. This series took after the Dolls of the World and the series is now called Princess Dolls of the World. A beautiful Steffie faced Barbie from Hawaii. In this version she wears a colorful flower print bikini set instead of the yellow grass skirt. Doll to the right has lost her bikini top but is wearing her bottoms under the grass skirt. Flower print reminds as the print on Ken's swim trunks below. 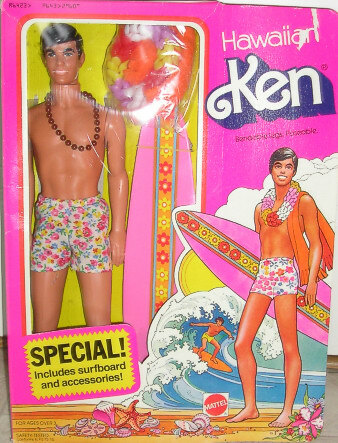 Hawaiian Ken was the first ethnic Ken doll ever sold and the only "Edwardian" face mold doll with brown eyes and such dark hair.